I was really impressed with Sands Beach Resort when I first visited the complex and I decided to purchase my apartment in 2007 and have made it my home away from home. I look forward to spending my holidays in Costa Teguise each year and being able to escape the winter weather back home in the UK. Great location & excellent weather you could not ask for more. I took the opportunity to purchase my apartment after visiting Costa Teguise for the first time and thoroughly enjoying my holiday, so much so I did not want to go back home. Hopefully on my retirement I'll be able to spend more time relaxing in the sun. The convenience of being my own home I can relax here and do things at whatever pace I feel there is no urgency then go back home to the UK feeling good having a lovely holiday with my batteries recharged. Fully tiled bathroom with shower over bath, toilet and bidet. Separate vanity area with two wash basins and full width/height mirrors and hairdryer. Spacious living/kitchen area. Concealed Pull Down double bed behind full length mirrored doors & pull out sofa bed in living area. Dining table and four chairs, LCD TV and DVD player. Filtered Water Open-plan kitchen with fridge - freezer compartment, microwave, toaster, twin hob, kettle and various cupboards fully equipped with crockery, cutlery, glassware, saucepans and utensils. The 18 hole par 72 golf course designed by John Harris is only a 5 minute taxi ride away, this is a challenging course surrounded with palm trees and stunning views of the Atlantic ocean. Notes on accommodation: The apartment is a much loved and cared for place I like to think of it as my home from home. Baby accessories cot/highchair maybe available on request at an additional charge. There are two plug in cooling fans and one heater at the villa. You are free to use the washing machine for clothes or the towels. Outside: The patio doors lead out onto the private balcony with a patio table and 4 chairs and sun loungers. It overlooks the private lagoon, promenade with a sea view. Cleaning / Towels / Linen / Maid service: The apartment is thoroughly cleaned prior to your arrival for a one to eight night stay. Nine or more nights there is a basic clean with a towel and linen change half way through. Additional cleaning/linen services can be provided at an additional charge. We had a great time the villa was clean & tidy & everything you needed was there. Would definately stay again. Having been to the resort over the last 30 years, this was one of the best villa's I have stayed in. They are all very similar overall but this one (bf69) was more comfortable / more relaxed than other villla's we have stayed in. We don't normally stay on the beach front as we prefer to be closer to one of the pools but given how the weather wasn't that great, closer positioning to the beach on this occasion was great as we spent most days there as the pools were freezing on the plaza's. We were also closer to the mai tai (heated pool) being on the beach front. The location of the villa in the resort meant it was very quiet / peaceful / relaxed. We didn't have the foot traffic going past like some other villa's in the past or the solei bar music in the back ground or when we have stayed on sol / the park and all the kids screaming / bouncing balls late in the evening. We enjoyed the relaxed atmosphere, and often sat on the balcony with breaky before the kids woke watching the surfers or those keeping fit jogging along the front promenade, the view of the horseshoe bay, with the waves crashing was most enjoyable. The villa had everything you expected (plates / glasses / blankets / pillows etc) and the washing machine an added bonus. It was spotless when we arrived and on the evenings we stayed in we watched one of the dvd's provided and felt really happy in the villa. The villa would probably be better for a couple or those without really small children or dads with large buggies / prams. Being upstairs and I knew this when i booked, it was the only thing i dreaded when leaving / going back to the villa was the steps. It rained for a few days and they were quite slippery. I often go to the resort with just my dad (no children) and would have no problem booking this villa if it was available. Thank you Mr Norris for allowing us to book. We had a great time for Halloween and all enjoyed the villa. The apartment is clean and tidy and has all the facilities need if you like to sill cater. It has plenty of facilities . Washing machine ,cooker ,fridge and plenty of room for a family. The balcony has two sun beds and a table and 4 chairs. A 10 second walk down the stairs and you are at the pools. Mr Norris the owner so a delight to deal and is happy to help . The complex the apartment is on has various other pools and is 100 mtrs from the sea and has plenty of bars and local shops a short walk away. Had a great stay in a nice apartment on a complex that has everything a person or family would need. I would recommend a stay at the apartment. Thanks for a fantastic stay. Will be back and recommend to friends and family. Everything was perfect. This is a great apartment in a beautiful complex, it has everything that is needed for a comfortable and enjoyable stay. Arvin is a most considerate host providing lots of extras to ensure a truly comfortable stay. We would highly recommend this apartment and hope to return again in the future. Apartment had everything you needed for a relaxing holiday. Very clean, plenty hot water all day, fans( which were a godsend). Apartment overlooks one of the numerous pool areas. Hotel surroundings were clean and tidy. Didnt really use many amenities from the hotel, choose to eat and drink in and towards the square, which was 15mins walk away but other bars and restaurants on way. Loved Costa teguise, would recommend the South Tour, loved the apartment, would recommend booking through Arvin, as it was very straightforward and hassle free. If you fancy just relaxing at the beach, then 5 mins or so walk and you're there. Las Cucharas Beach is a beach with 640m of golden sands protected by breakwaters - this beach sits in the heart of Costa Teguise. It's of the favourite beaches for windsurfers. Services including, restaurants, handicap access, parking, bus stop a sports equipment rentals. There is also Los Charcos Beach, EI Jablillo Beach, and Bastian Beach in Las Caletas close to Costa Teguise or by car there's Papagayo beach. 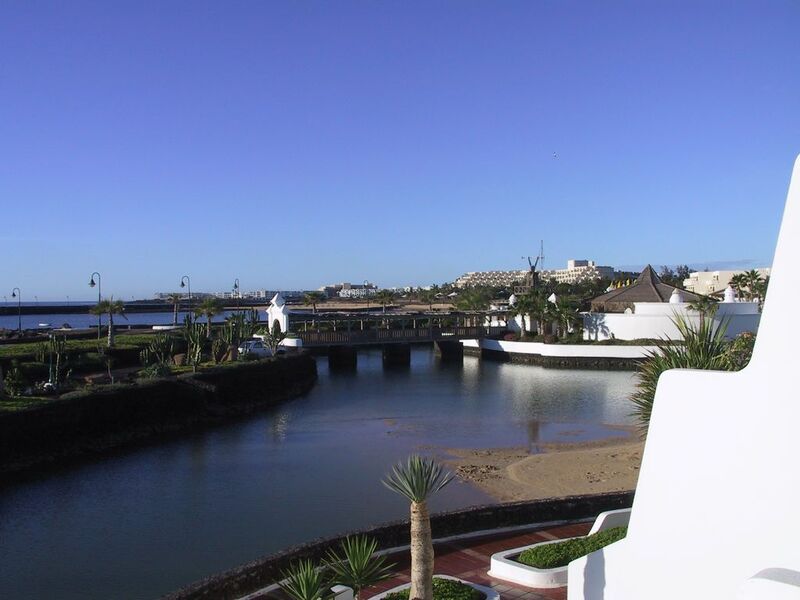 Sands Beach Resort is approximately 15-20 minutes from Arrecife Airport. I always pre-book my transfers with Last Minute Travel Lanzarote, very professional and reliable transfer company. There are plenty of vehicle hire companies to choose from if you wish to explore the island. Public transport from near Sands Beach Resorts leaves every 20 minutes during the day to Arrecife with connections further afield. Sands Beach Resort is approximately 15 to 20 minutes from Arrecife, 30 minutes to Puerto Del Carmen, 10 minutes to the Aquapark, Golf course and Manrique foundation. The Tequise market on Sunday is located 30 minutes away and there is either public transport and/or organised tours available. Lanzarote boast some truly beautiful places from the volcanic Timanfaya National Park to the Jameous del aqua and the picturesque fishing town of Yaiza. Booking Notes: On enquiry I will send you a provisional booking form by email or post for your completion and return to secure your dates with a 25% deposit (non refundable) payable and the balance is then due from five to ten weeks before your arrival. Payment can be made by cheque, bankers deposit or BAC's bank transfer. Changeover Day: Please contact owner.